Now, IRCTC SMS will serve as E-Ticket for train travel! Indian Railways is bringing up much needed changes to the system and making life easier for Indian train travelers. For few years now, the only accepted way for E-Ticket confirmation was carrying a physical paper printout of tickets booked online. Tons of paper was wasted purely on this. 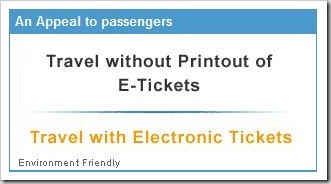 Few months back, IRCTC announced that there was no need of a physical printout of E-Ticket for train travel. A passenger could just take a screenshot on his mobile and it would be valid. Now, Indian Railways has gone one step further – the Ministry of Railways has decided to permit SMS confirmation sent by IRCTC containing vital details as an proof on par with the Electronic Reservation Slip (ERS). This has come into effect from 1st February, 2012. Essentially, when a user books a ticket online, he is sent a SMS confirmation from IRCTC giving details of his journey along with ticket details. A traveler can just show that SMS on his mobile along with a valid ID to the ticket checker. That will be valid proof that he has the ticket and can travel without any issues! The SMS would contain all the vital ticket details like PNR, Train Number, Date of Journey, Class, Name & Number of Passengers, Coach & Seat Number and Fare paid. Also if feasible, the SMS will accommodate the names of all passengers booked on the e-ticket, otherwise maximum number of passengers. The authorized SMS containing all the aforementioned vital details when displayed through laptops / palmtops / mobile phones combined with valid photo-id in original shall be treated as an instrument on par with the ERS. And if you are smartphone user, it gets even easier. Earlier in Jan, Indian Railways partnered with 3 Indian mobile payment gateways that allow users to book & pay for Railway tickets directly on the mobile phone. Kudos to Indian Railways for making Train Reservation Ticketing System passenger friendly – This will surely save lot of effort and at the same is extremely environment friendly! "Now, IRCTC SMS will serve as E-Ticket for train travel! ", 5 out of 5 based on 1 ratings. as easier process just open your browser search http://www.irctc.co.in and fill same id which you booked your earlier ticket. and then look at left top corner wher you can find the book history and search down. now you can see the list of ticket you booked click in the box of your ticket which you needed and then you can print it out or can to get sms. If the TC asks me to show any of my ID proofs, can I show him from my smart phone as I had all my documents of proof in my phn. ???? In some places of the world if you show the ticket on your mobile screen it works. At present, people are using this facility and people who are aware of this are increasing in number.But most of the people around in AP are unaware of this and have to educate people to use this facility. IRCTC have moved a step towards the internet / online world..
it good only for educated people but there are so many people who are not educated and not any idea of about how to use mobile , laptop. even not having mobile phone. How to check old prn status. I am Swapan Nath from Rupnarayanpur. Hey..can I book a ticket for my friend and forward to his number?I mean..can I just forward the sms?? Hi every1, I’m malaysian indian, have travelled to india many times and dont have any indian based mobile number. Now I have plan to visit India again but IRCTC system requires to key-in local contact number. If sms is forwarded sms (or you do not have sms), you are treated without ticket. What happened to the rule that if you do not carry print of ticket, Rs 50/- fine will be levied. Hey..can I book a ticket for my friend from my mobile number?and forward him the SMS after the confirmation?Is that allowed? hi frds,this site is the best site for the e-ticket booking. This is already being used for more than a year in Karnataka ST buses – KSRTC. They also have an interface for used to re-send the sms to a mobile number if user wants to! IRCTC sms’s are not consistent – some times you get & some times you dont! Sorry to tell u mam… but i think un educated people will not even be able to log into IRCTC.. so it makes sense to say that.. right..?? ?